I can still remember the first time I watched VeggieTales as a kid. I was about six years old, and was a little skeptical of the talking, animated vegetables that appeared on screen. After a couple of minutes, however, I was laughing at all the corny jokes, watching breathlessly as they played out the story of Daniel, and singing along with Larry the Cucumber’s "Everybody Wants a Water Buffalo." Fast forward two decades later, and once again I found myself somewhat skeptical of the Veggies' most recent release, The Little House That Stood. Just like last time though, it all ended with a smile, because even after all these years VeggieTales remains a timeless series about God, kids, and laughter. The first story begins in the town of Cabbageville, where three popular builders are competing for the first ever “Builder of The Year” award. Now, it turns out each of these three vegetables prefers a different material when constructing their homes. Larry like to build his houses out of hay, Mr. Lunt creates all of his out of bricks, while Bob makes his from sticks, but only Bob takes the time to build his houses on a strong foundation. When three little pigs come driving into town, each needing a new house, the builders all see an opportunity to finally claim the grand prize. As you can imagine, only one house stands firm when the winds start to “huff and puff”. Our second tale, which parodies classic childhood nursery rhymes of Mother Goose, follows Humpty Dumpty (Bob the tomato in an egg suit) as the acting mayor of his little village. In the past, Humpty has done his best to help out his fellow neighbors, but lately the stress has been getting to him. When Little Bo Peep loses her sheep yet again, Humpty decides it’s time for a vacation. His selfish action ends up sparking a chaotic chain of events throughout the town, and in the end poor Humpty realizes his would-be vacation is a lot less relaxing than he thought it would be. Fortunately for this lyrical tale, he also learns it’s never too late to make up for your mistakes. Probably the most important thing to address about The Little House that Stood is its underlying message. In the past, some people have accused VeggieTales and Big Idea of "moralistic deism," or to put it in English, teaching lessons about "being good" instead of loving God. Any parents worried about the fine print should consider this latest installment solid proof that the show has not lost its way. Bob’s building mentor, Mr. Zucchini, frequently mentions that solid foundations aren’t just for houses. God wants all children to make Him their firm foundation, so no matter what life throws their way, they will still be able to stand firm. 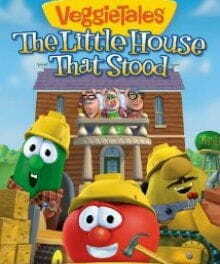 Overall, The Little House That Stood is a great addition to the classic, kid’s series. The added fairy tale twist is sure to be a hit with audiences of all ages, and it provides a number of great talking points about life, discipline, and generosity for parents to share with their children. If you’re looking for a great family-friendly story, and a silly song to boot, The Little House That Stood won’t disappoint.